Hi everyone, hope you're all grinding hard as the year comes to a close for that sweet LP. This patch features some interesting "buffs" and "nerfs" where player experience doesn't seem to match Riot's original intentions for the change. The Janna and Xin Zhao changes are somewhat unclear in terms of intent, but Janna's been hotfixed after a very brief stint hovering at 58% win rate and a continued close to 100% ban rate. Meanwhile, Zed continues to dominate the hearts of solo queue players everywhere, so be sure to get that Zhonya queued up for purchase. Aatrox [Tier 3 Top] - It's been a long time coming, but at last, Aatrox is back in the game. He's by no means a popular pick in the game, but at least he registered as a non-troll pick after the latest round of buffs on all the stat sites. Caitlyn [Tier 1 Marksman] - The latest Caitlyn buffs aren't enough to bring her back into overpowered status, but anytime Caitlyn gets some lovin' the marksmen mains jump out of the walls to pick her back up again. Her lane control is exceedingly good, and she's very satisfying to dominate with alongside a traditional peel support. Fiora [God Tier Top] - Fiora's still very good, but the honeymoon phase right after her buffs from 7.18 are wearing off. As a result, Yasuo's still the major fallback for most top laners. Janna [God Tier Support] - Originally, we thought Janna's tweaks were a nerf, but turns out the days directly after the buff, Janna's win rate skyrocketed with her absurd damage output. Since then, she's been hotfixed, but continues to be very strong. Lulu [God Tier Support] - The Ardent Censer buffs have made Lulu incredibly strong. Her attack speed boost was always good for marksmen like Twitch or Tristana, but now she gains more than ever before with Pix scaling hard with the increased attack speed boost. Sejuani [God Tier Jungle] - Sejuani's one of the most feared junglers at higher divisons right now. She's impossible to burst and very difficult to prevent from engaging. Having Janna on your team helps, but her ultimate can still land even if you knock her back. It's a bit of a moot point though, since Janna's almost permabanned. Tristana [God Tier Marksman] - Tristana continues to be a massive powerhouse with the latest changes to Ardent Censer. Although the defensive heal was reduced slightly, the offensive power was greatly amplified for auto-attacking champions that like to all-in (i.e. Tristana). 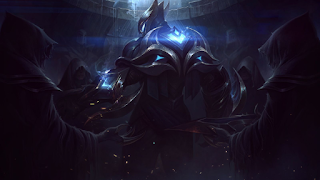 Zed [God Tier Mid] - Zed's one of those obnoxious champions where it seems like all the Zeds on the enemy team are Korean challengers and all the Zeds on your team are first-timers that just got stomped by a Korean challenger. Most people prefer to ban him out rather than deal with this kind of bipolar experience, but when he's not banned he's picked up quite often.